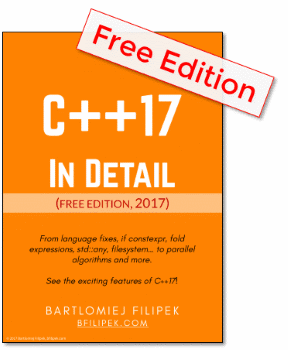 Have you seen my recent blog post with the list of C++17 features? Probably this is not the best measurement, but it got only ~30% of the average read (while other articles might get like 70, or even 90%). I am not complaining, the list is crazy and contains probably too many details of the new standard. It looks like C++17 is almost ~80% ‘larger’ than C++98/03. You can complain about added complexity and that it’s hard to learn all of those things. But is this so terrible? What can you do about the whole situation? First, let’s see some problems that you might bump into in C++. As usually, we might have two contradicting opinions here. Although for some people the pace is slow, for others it’s hard to keep up with the changes. I don’t write a lot of generic code, so fortunately I don’t have to think about move semantics all the time. But I was quite confused when I bumped into move and const - see my last article on that. I don’t believe every C++ will understand the rules here. Especially that you now need to remember about 6 default operations generated by the compiler: default constructor, destructor, copy constructor, move constructor, assign operator and move assignment operator. Previously you just had to know lvalue vs rvalue, now it’s a bit more subtle. While it’s not super great as for other languages (especially Java based or .NET based), it’s getting better and better. Bear in mind that because of the complex C++ grammar it’s very hard to implement tools that analyse the code on the fly. C++ community is very much alive. There are many blogs, books, conferences… and there’s even a chance a local community is in your city! For a start, I just suggest going to isocpp.org the central place for all of the events/news/articles. Then you might check Meeting C++ and info about local C++ groups. There’s also reddit/cpp where constantly more and more good stuff is posted. One of the reason why C++ specs are getting larger and larger is that the language is backward compatible. So the committee usually introduces new features, but rarely remove the old stuff. So… your code can still compile. If you don’t want to move and use newer things then you can stay with your current style. From time to time you’ll get some warnings about deprecated stuff or removed features (like auto_ptr in C++17), but even in that case, you can switch the compiler to target some older C++ standard. While we can complain about the complexity, pace of changes, etc… I think we cannot say that the language is dead. That’s a good thing.